The Poas Volcano Lodge – The Perfect Location! The Poas Volcano is one of the most visited national parks and volcanoes in Costa Rica. While there is no lodging or camping allowed within the park itself. The Poas Volcano Lodge offers visitors a charming place to stay within driving distance of the volcano. Also, the world famous La Paz Waterfall Gardens. This boutique mountain lodge surrounded by rolling pastures and breathtaking views is stunning and well worth a visit for a night or two. After that, you can decamp to experience the rest of your Costa Rica vacation. Here at the lodge you’ll feel welcomed from the moment you arrive by the friendly staff. The hotel features 11 fabulous suites, divided between the main building and the outside garden rooms. Some of the rooms feature private gardens and balconies and are very cozy and comfortable – making this the perfect romantic getaway or place to visit with your family. 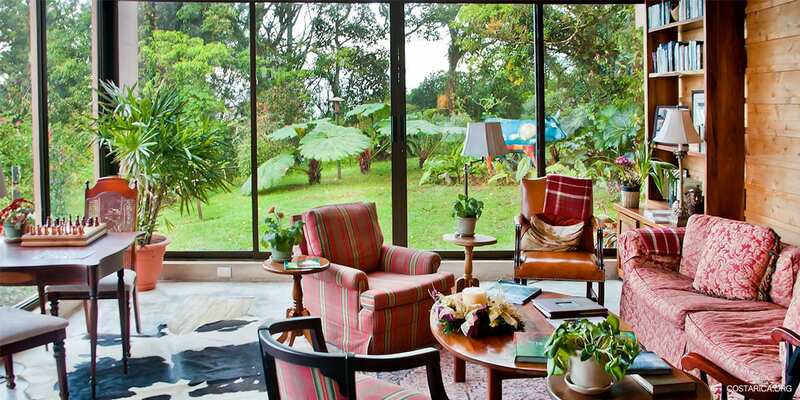 The lodge sits on the edge of a cloud forest next to a working dairy farm. The lodge was recently renovated and designed by one of Costa Rica’s top architects making this a very architecturally unique building. The main living room with its large fireplace is warm and inviting, giving you the opportunity to share your experiences with other guests or staff. There are several common areas at the lodge that makes you feel more at home than just another guest of a hotel – including the Bromelia restaurant, the elegant sitting room, the library, the game room with pool table and beautiful gardens. The Poas Volcano Lodge is the ideal place to relax with friends or loved ones and enjoy the beautiful countryside of Costa Rica. You’ll, in fact, find that each of the eleven rooms at Poas Volcano Lodge has its own unique style and individuality. They have all been recently refurbished and tastefully decorated. Offering guests the perfect place to stay and relax after a day of exploring this beautiful area. The six master suites found in the main building are spacious, and three offer fabulous views of the mountains towards the Poas Volcano and the other three offer private gardens and views of the cloud forest. The remaining 5 Junior Suites are located in the gardens off the main building and are cozy and comfortable options for guests. The stone and wood found throughout the lodge are very striking. All in all, making this one of your best options near the Poas Volcano and National Park.